How many times have we said – ‘I wish I had known’? The following will hopefully be sufficiently useful that after having read it, you won’t have to say that again. Hockey Canada has an excellent handbook available. Go to the Hockey Canada website:www.hockeycanada.ca and select ‘Minor Hockey’, and then under ‘Other Programs’, see ‘Canadian Development Model’. It is downloadable as a PDF file. On the same page there are links to a number of league websites from across Canada. This primer will be upgraded every year until we have covered every issue and laid out every option. 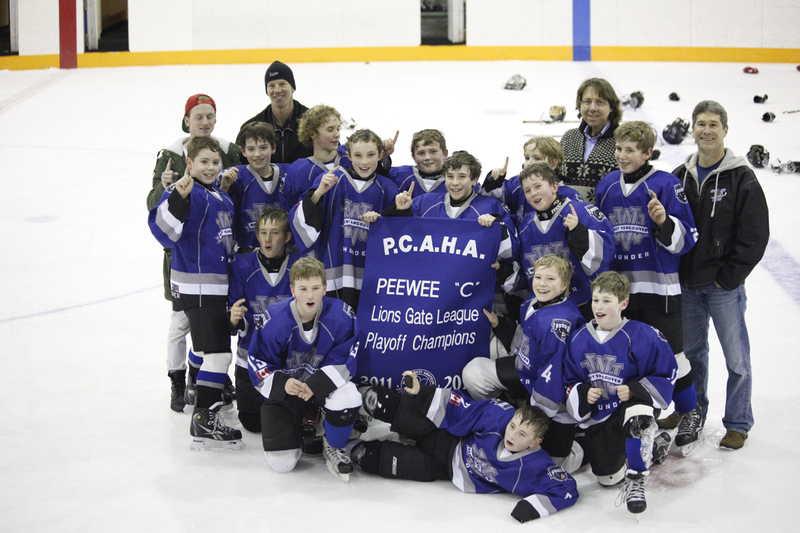 Playing competitive hockey for PeeWee age players is limited to Minor Hockey. Skaters and goalies need to become self-motivated and only rely on their parents for support – not for motivation. Developing core strength and balance in addition to on-ice skills, is critical if you hope to be able to play competitively once you move out of the nice homey Minor Hockey Association. Should consider registering for ‘Global Sports Camp’ (see details below). Body checking is now a part of game play. 2nd year Bantam players are eligible to try out for the ‘BC Best Ever U16’ program. Our zone covers: Whistler, Squamish, Sunshine Coast, West Vancouver, North Vancouver and Vancouver. A team is selected from the best in all the minor hockey associations in the zone. The try-out camp is an open camp and it is a highly intensive few days. For details see ‘www.bchockey.net’ and select ‘High Performance Programs’. Making the team is an incredible experience and maybe followed the next year by an invitation to the U17 try-outs. Invites to U17 are based on independently evaluated performance over the following winter season. Invitations are often received in the second year of Bantam; especially by those who make the U16 team or who have attended Global and showed well, from WHL (Western Hockey League), Junior A and Junior B teams. Many of the Junior A and B team ‘prospect camps’ are fund raisers for the teams so they need to be well researched to ensure benefit is derived from the camps. Invitations to any of the WHL team rookie camps should be taken seriously and are usually at no cost but if you are interested in pursuing an NCAA scholarship, you must be careful about not doing anything that could negate your NCAA scholarship eligibility. NCAA typically select players for scholarships from the Junior A teams. The ‘Bantam draft’ for the WHL teams takes place at the end of the 2nd year of Bantam and not being drafted does not mean that your hockey career is over! Developing core strength and balance in addition to on-ice skills is critical if you hope to be able to play competitively once you move out of the nice homey Minor Hockey Association. Competition is fierce and just being a skillful player may not be enough. The Major Midget program is for Midget age players who are capable of playing at a competitive level. The best players from Whistler, Squamish, Sunshine Coast, West Vancouver, North Vancouver and Burnaby are selected for the ‘Vancouver North West Giants’. Unlike Junior hockey, under normal circumstances, once signed with a Major midget team, you are there for the season. Making the team as a 1st or 2ndyear Midget player is no guarantee that you will be signed the following year. Many of the better players in this league, end up by bypassing Junior B teams and are signed directly by a Junior A team after 1 or 2 years at Major Midget. Junior A and B teams cannot sign 1st year age Midget players and are only allowed to sign a maximum of two 2nd year age Midget players. See the section on: Junior Hockey in BC. Take a break from hockey after the season ends for 2-3 weeks, but use the spring and summer for enhancing skills, keeping fit and developing mental strength. Players who turn up for try-outs without being mentally and physically fit and prepared, significantly reduce their chances of success – regardless of whether it is a Minor Hockey Association rep tryout or a Junior team tryout. What you do in the off-season will dictate how well you do in September to April. Make sure that whatever program you sign up for is hockey specific. Be proactive in asking the coaches what you can do to improve – don’t just wait for them to say something to you. Some of the programs are age customized to be age specific so listen to the experts – they usually know more then the player or the parent. You must eat well in order for your body to be able to handle the demands of competitive hockey. Therefore the sooner you make it a habit rather than a chore; the easier it will be for you to compete. Mental toughness is just as important as physical toughness. If you are going to get upset every time a coach treats you in a manner that you consider unfair or you allow a bad call by the ref to upset your game, you won’t last long in competitive hockey. Visualization is a very powerful tool so you might want to consider reading a book such as ‘Hockey Tough’ by Dr. Saul Miller. (See the resource section). Daily visualizations should be part of your training regime. The ‘showcase’ has been operating for the past sixteen years in Burnaby and for the last few years Las Vegas. It allows Junior hockey players and minor hockey players to exhibit their abilities to scouts from teams in the B.C Hockey League as well as scouts from all of the various Junior Hockey leagues throughout Canada and the United States. In addition, parents can receive vital information on possible hockey developmental opportunities. Global has an educational advisor on staff who assists players and parents by answering questions about educational and eligibility requirements for N.C.A.A. Hockey. Attending Global will also get you on the ‘invite’ list to Junior team tryouts. There are a lot of coaches and scouts at Global so don’t be pushy with them. A ‘pain in the backside parent’ is a barrier to the success of their child!! Playing Junior hockey requires a tough and determined mental approach as teams are run as a business and are therefore not like minor hockey associations. Winning is major factor to team spectator attendance numbers which depend upon win/loss stats. Most of the coaches are fair and treat players well. Others are perhaps not what you have been used to in minor hockey. Remember, unlike Minor Hockey where you are a member of the Association and have a say in what goes on, when you are on a Junior team, you are just a team commodity for them to release, trade, sell or sit. To be successful, you have to make hockey your job and your passion. You will be expected to work out regularly, eat well, accept the team designated curfew time and work hard every time you are on the ice – regardless of whether you think that the coach is being fair. There are 3 Junior B leagues and 1 Junior A league. Teams have from 1 – 3 camps; Prospect, Rookie and Main. Prospect camps are usually ‘open camps’ with a very wide spectrum of skills attending. Many teams run the prospect camps as a fundraiser so don’t be surprised if the caliber of play is not what you expected. However, until you are a recognized and sought after player, attending them is a necessary step to being invited to main camp. Before deciding to attend a team camp, it’s probably worth having a look at their prior year rosters to see how many players are likely to be returning so that you can assess what the likelihood of you being signed. If you are fortunate enough to be signed, the team owns you and they can trade you or release you whenever they want. That ownership does not end with the end of the season. It carries on to the following December so that you are not free to tryout anywhere else in BC except in a higher league. Even then, the team does not have to release you. When you receive an invitation to attend a tryout, before committing, you need to decide whether even if they offered you a card, would you want to play there. Was the invite addressed to you personally or was it a blanket mailer? What have you heard about the coach? The process of planning is never simple. When you have committed to attend the prospect camp, and you are invited to move onto that team’s rookie or main camp, there will frequently be a date conflict with another prospect camp that you have committed to attend. You have to then make a decision to either stick with the first team or move onto the next team’s camp. If you want to continue living at home, the number of teams open to you is pretty small. So, if you really want to play Junior hockey, you will likely have to leave home and live with a billet family. Costs vary from $300- to $400- per month for room and food. You will still have to address transportation issues. Most teams are really good at helping you get registered at the local school and making sure that if you are still at school, you keep your grades up. If you are not at school, they usually will also help you find part time work. You can be released or traded at any time prior to the deadline in January. And, you have to contend with the trickle down effect – a player is released from a WHL team who is signed by A Junior A team who releases a player who is signed by a Junior B team and get what – you are released or traded. Only a handful of hockey players get to choose which path they pursue. The reality is that there is only a slim chance of being offered a position in either one of these two categories so the wisdom seems to be – go with whoever wants you the most. By the time you are actually having to make this level of decision, you will have made plenty of contacts of your own and will be able to get the appropriate advice. If you decide to pursue an NCAA scholarship, you must ensure that you have not received any payment for your playing the game of hockey. Even accepting an air ticket to go meet with a team can jeopardize your eligibility for an NCAA scholarship. Teams in the US are only allowed 2 or 3 import players so unless you have dual citizenship, you would have to demonstrate that you are worth one of the import cards. If you want to try out for a US team, you must register on with Hockey USA. (www.usahockey.com) The cost is minimal and it covers you with insurance while you are on the ice.